When Tom and I first moved in together, after dating for 6 months it was to a small top story flat in a 'bohemian' area of Bristol. It had a teeny tiny bedroom, enough for one bed, one wardrobe and one bedside table and not much space to squeeze round these to get into bed. It had a teeny tiny kitchen too with space for a fold down table and a sash window where we often envisioned growing herbs but never got round to doing. When we started thinking of buying our own place we collected scrap books and cut out of 'Good Homes, Elle Decoration and Living Etc' what our dream home would look like and how we would furnish it. We filled two books with our interior wishlist (now of course we just use Pinterest). After moving into our home six months later the kitchen was not top of our priority, it was..liveable although the tiles would come away under your feet and the work tops made me sigh everytime I went to make a cup of tea. We had bigger problems to deal with, what with needing to level the floors in the living room, put wood down and re-carpet the top of the house. There was a time the whole downstairs of our house was concrete, we had one plastic garden chair and a portable TV Tom had owned in uni. It sounds almost romantic now in a way but it wasn't at the time! Six months or so after we moved in we found out we were expecting Wilf and we realised that the kitchen although liveable needed to be re-doing now (or it never would be). With limited funds Tom and our friend ripped it out (I was 37 weeks pregnant by this point) and we installed the kitchen we have now. 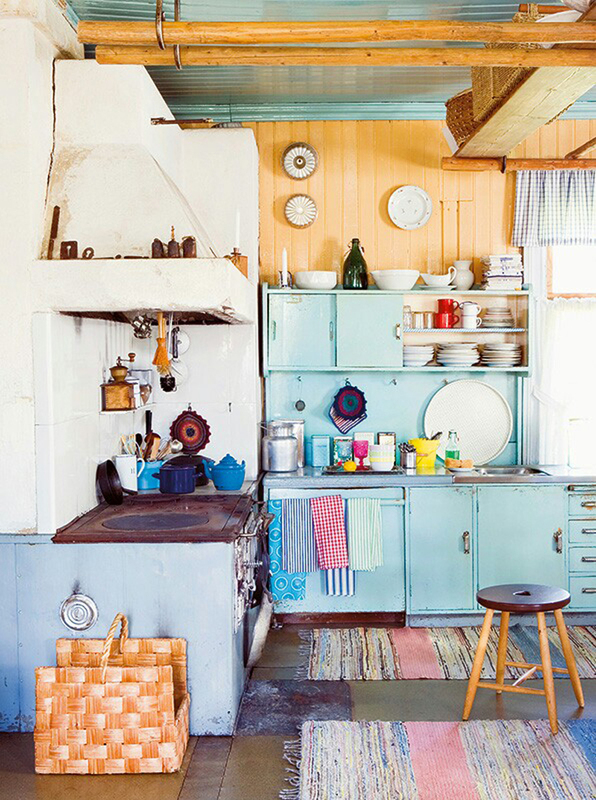 We have wooden services, a white porcelain apron front sink and a turquoise vintage dresser I love how it mixes vintage pieces with new, although all modcons like a washing machine and dishwasher were essential! You can see a little of our kitchen in this post. What is your dream kitchen style like? 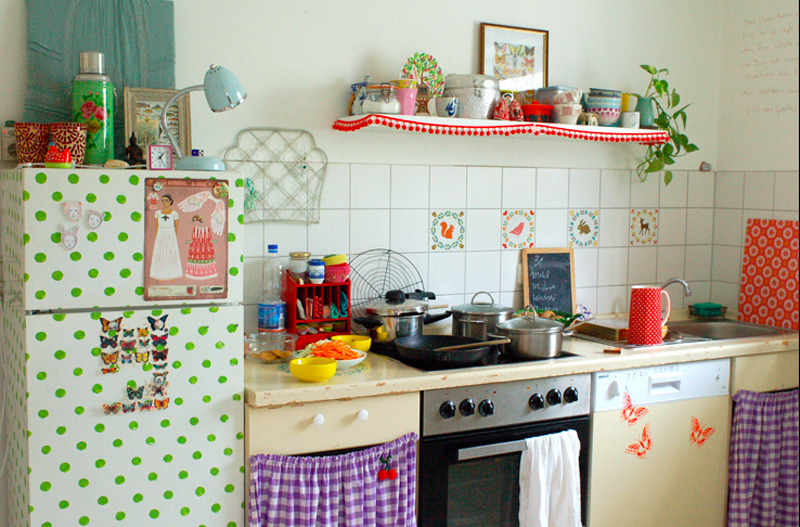 Do you love your kitchen or wish to revamp it all? Do you go for sleek and modern of colourful and mix match? I inherited the kitchen decor from the previous owners - its all very Edwardian ( our house is a listed building) I did take out the AGA, i know that some might think thats mental but I hated cooking with it.I would like to change the paint its a sort of deep burgundy to a nice deep green and get the floor tiled black and white, other than that I love it.my favorite bit is my glass front cupboards in which i keep my vintage tins and tea caddies. I love blending vintage, brand new and handmade. I especially love vintage china. My, husband, Edith and I move house this year and we're building our scrap book on pintrest. This is called a cheap and good kitchen design. This kitchen is managed in a really a nice way. color combination is also looking great. Recently I have seen some beautiful kitchen designs on Noel Dempsey website. They are providing some beautiful designs.